As a soloist she has given many recitals at major London venues including St Martin’s-in-the-Fields, the National gallery and St James’s Palace. She has appeared at the Swaledale Festival, toured the Mediterranean aboard the QE2, and has performed concertos with orchestras including the Dart Festival Orchestra and the Ten Tors Orchestra. As part of her award from the Martin Musical Fund, she toured with the Unicorn Theatre Project / Philharmonia Orchestra for their production of the opera Clockwork, culminating in performances at the Linbury Studio Theatre, Covent Garden. Harriet has worked regularly with many orchestras including the Philharmonia Orchestra (where she also performed in their Music Of Today series), the Orchestra of the Swan, St Paul’s Orchestra and Northern Sinfonia. Her most recent solo recording received 3 stars from BBC Music Magazine, with many favourable reviews nationally. 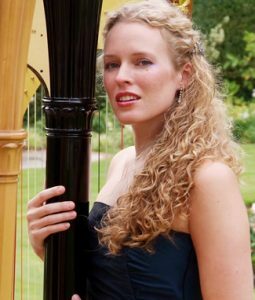 Alongside her career as a professional harpist, Harriet is also a composer specializing in solo and chamber works for harp. Her critically acclaimed composition, Sun, Moon and Stars for harp quartet, was selected for performance at the 9th World Harp Congress in 2005, and her 2012 work, Elemental for harp quartet, was performed live on BBC Radio 3’s In Tune program. Harriet’s music is now stocked in the USA and has been used by the Philadelphia Orchestra for a harp ‘play-in’ day. In 2017, a video of Harriet’s harp quartet arrangement of Shostakovich’s famous Waltz no.2 went viral across the world, receiving well over 2=3.5 million views! Harriet is a member of the internationally recognised 4 Girls 4 Harps, whose music has been broadcast on Classic FM, BBC Radio 2, BBC Radio 3 and BBC Radio 4. They have played at many prestigious venues such as St James’s Piccadilly and St George’s Bristol, and were invited to perform at the 9th World Harp Congress in Dublin.